To Cite: Miladinia M, Pishgooie A H, Aliyari S, Mousavi Nouri E. The Comparison of the Effect of Two Complementary Medicine Methods (Music Therapy and Massage Therapy) On Postoperative Acute Pain After Abdominal Surgery: A Randomized Clinical Trial Study, Iran Red Crescent Med J. 2017 ; 19(6):e14974. doi: 10.5812/ircmj.14974. Background: Despite advances in postoperative pain control, it is still a big challenge with high-prevalence for practitioners. Inadequate control of postoperative acute pain is common which can lead to serious complications for patient. Objectives: This study aimed to compare massage therapy and music therapy in the control of postoperative pain and amount of received opioid drug after abdominal surgery. 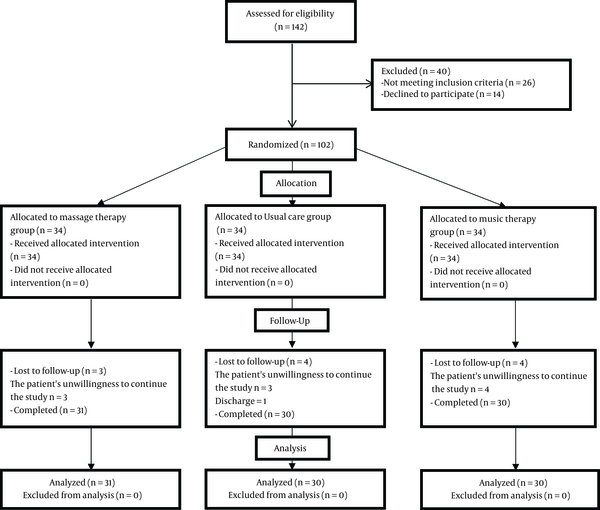 Methods: In this randomized 3-group trial, 102 patients in the surgical wards of 3 military hospitals, Ahvaz, Iran, were randomly allocated to music group, massage group, and usual-care group. Participants in the massage and music groups received 10-minutes sessions of slow-stroke back massage and without lyrics music, respectively, 1, 6, and 12 hours after surgery. The pain intensity was measured by numeric rating scale 10 minutes after each intervention session. Also, the mean of received opioid drug during 12 hours was measured in each group. Results: The results indicated a decreasing trend of pain intensity in all the groups. However, the trend of pain intensity had a significantly more decrease in the massage group compared to the both music group (P = 0.001) and usual-care group (P = 0.001). Pain intensity at the baseline had no significant difference between the massage group and the music group (Mean ± SD: 7.13 ± 1.2 vs. 6.97 ± 1.3, P = 0.6); whereas, pain intensity 12 hours after surgery had a significant difference between the massage group and the music group (Mean ± SD: 2.26 ± 1.03 vs. 3.30 ± 1.5, P = 0.002). Also, the mean of received opioid drug was significantly lower in the massage group than both the music and the usual-care groups (P = 0.013 and P = 0.001, respectively). Also, the mean of received opioid drug was significantly lower in the music group than the usual-care group (P = 0.047). Conclusions: Massage therapy was more effective than music therapy in controlling postoperative acute pain after abdominal surgery. Hence, the use of non-drug methods (especially massage therapy) as safe, inexpensive, effective, and available methods are very helpful for controlling postoperative acute pain. Despite advances in postoperative pain control, it is still a big challenge with high prevalence for practitioners (1-3). In the past two decades, despite the development of guidelines for acute pain management and analgesic drugs, surveys claimed that a slight improvement has been made in terms of postoperative pain control (4-6). The study of Gan et al. (2014) showed that 75% of patients experienced moderate to high pain during the immediate post-operative period (4). Sommer et al. (2008) investigated 1490 patients and showed a high prevalence of moderate-to-high pain among the patients undergoing abdominal surgery (30% - 55%) (7). Postoperative pain after abdominal surgery is still a serious and worrisome challenge (8). Inadequate control of postoperative acute pain is common and it can lead to serious complications for patient. These complications can include progress to chronic pain, deep vein thrombosis, urinary retention, cardiac and pulmonary adverse consequences, neuroendocrine dissatisfactions, gastrointestinal dissatisfactions, psychiatry disorders, and sleep disturbances (2, 3, 6, 9). Hence, inadequate management of postoperative pain can contribute to longer recovery, prolonged hospitalization, prolonged convalescence, extra costs, and patient’s dissatisfaction (6, 10-12). Although opioid drugs are the main method for controlling the postoperative acute pain, they are accompanied by certain challenges and limitations (1, 13). Inadequate training of health professionals, concerns about ethical issues and fear of side effects of opioids can lead to choose the lowest dose of medication by staff. Anyway, opioids alone may not be sufficient to control the pain (14) and postoperative pain is not still adequately relieved (3, 6, 13, 15). Therefore, using safe non-drug methods along with drug therapy can be helpful in controlling postoperative pain. Massage therapy and music therapy are two available, easy, and safe complementary medicine methods, which can be used for patients undergoing surgery. Music therapy is one of the cognitive-behavioral methods with mental, physical, and psychological sedative effects (15, 16). Massage therapy is a scientific manipulation of body textures with physiological, neurological, psychological, and biomechanical effects (17). Literature review shows that some studies have been conducted on the effect of massage therapy or music therapy on postoperative pain (18-22). Only one study compared the music therapy and massage therapy on postoperative outcomes. This study was associated with some limitations: first, a few patients participated in the study (13 patients in each group); second, different types of surgeries were taken into account; third, for the evaluation of controlling pain, they only assessed the received drug not the pain intensity (23). In general, we did not find a comparative study of music therapy and massage therapy on postoperative acute pain after abdominal surgery. Since music therapy and massage therapy have different mechanisms with their own advantages, comparing them can provide clinical evidence to select the more effective method for postoperative pain control. This leads to targeted postoperative cares and patient’s outcome improvement. This study aimed to investigate the comparison of massage therapy and music therapy on the control of postoperative pain and amount of received opioid drug after abdominal surgery. This randomized three-group trial was conducted in 2015 - 2016 at surgical wards of three hospitals in Ahvaz, the southwest of Iran. These hospitals were general military hospitals with 8 to 12 sections and 80 to 100 beds. The sample size was calculated based on Poukak formula, with a power of 80% and α of 0.05. By considering a 10% drop-out during investigation, 34 patients were allocated to each group. Block randomization (sextet blocks) was used for randomization. Participants were randomly allocated to either of massage therapy group (34 patients), music therapy group (34 patients), or usual-care group (34 patients). During the investigation, 3, 4, and 4 participants were excluded from the massage group, music group, and usual-care group, respectively (Figure 1). The inclusion criteria for this study were as follows: patients who had 1) age of 18 - 50 years, 2) intensity of postoperative pain of 3 or more, 3) lack of known acute or chronic pain disorder in their medical history, 4) no comorbidities such as diabetes, peripheral nerve disease, etc. and, 5) no problem in hearing and massage areas. The exclusion criteria during the study were as follows: 1) discharge during intervention, 2) transfer to another hospital, 3) unwillingness to continue the investigation and, 4) side-effects occurrence such as bleeding, hypotension, etc. This investigation was approved by the ethics committee of AJA University of Medical Sciences, Tehran, Iran (ethic code: ir.ajaums.rec.1395.02) and registered in the Iranian clinical trial center (IRCT code: irct2016052921307n2). The ethics were observed according to the Helsinki declaration. The study data were collected using a form for recording participants’ demographic and surgical-related characteristics, a form for recording received opioid drug, and numeric rating scale for measuring pain intensity. Numeric Rating Scale (NRS) is a 10-cm ruler assessing the pain experience. The right and the left sides of the ruler represent 10 (worst pain imaginable) and 0 (no pain), respectively (6). Massage therapy intervention: participants in the massage therapy group received 10-minutes sessions of slow-stroke back massage (SSBM) 1, 6, and 12 hours after surgery in addition to the usual care. In total, 3 sessions of massage therapy were performed for each patient. The SSBM steps were as follows: 1) a separate room with suitable environmental conditions was considered; 2) the objectives and the procedure of massage therapy such as number of sessions, duration, etc. were explained to each participant; 3) before performing the procedure, the masseur warmed up his/her hands by chafing them together. Music therapy intervention: participants in the music therapy group received 10-minutes sessions of music 1, 6, and 12 hours after surgery in addition to the usual care. In total, 3 sessions of music therapy were performed for each patient. The music therapy steps were as follows: 1) a separate room with suitable environmental conditions was considered; 2) patient laid on the bed; 3) participant listened to a music without lyrics (sounds of birds, ocean, piano, etc.) by a headphone. Three selected music pieces were relaxing and non-aggressive with 60 to 80 beats per minute under controlled volume (50 - 70 decibel). First, pain intensity was measured using NRS after the patients of the three groups entered the surgical ward. Also, 10-minutes after each intervention session, the pain intensity was measured again in the massage and music groups. 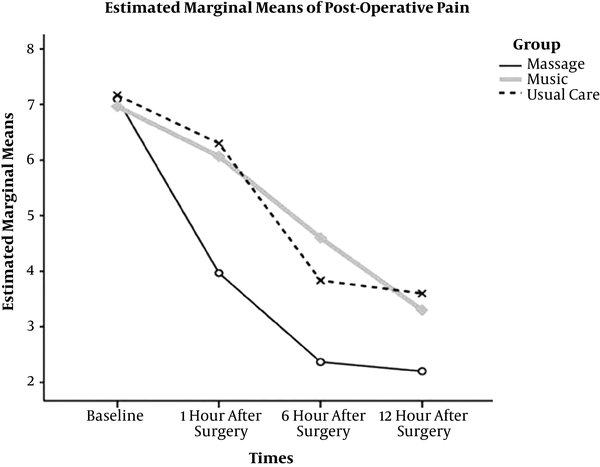 In the usual-care group, pain intensity was measured again 1, 6, and 12 hours after surgery. The amount of received opioid drug during 12 hours after surgery was also obtained from patients’ medical records. Data were analyzed by SPSS software (version 16). P value < 0.05 was considered significant. Chi-square test was used to compare categorical variables between the groups. One-Sample Kolmogorov-Smirnov test indicated quantitative data are normally distributed. Hence, the one-way ANOVA test was used to compare quantitative variables between the three groups (in terms of pain intensity, received opioid, and age). Besides, the least significant difference (Post Hoc LSD) test used for multiple comparisons of differences in pain intensity trend and mean differences in received opioid drug between the groups. Also, comparing the trend of pain intensity over time between the groups (from baseline to 12 hours after surgery) was performed by the repeated-measure analysis of variance (ANOVA). In the final sample size (n = 91), most of the subjects were male (64.8%), married (63.7%), and undergoing appendectomy surgery (50.5%); they mostly had no history of other surgeries (92.3%) as well as no history of serious disease (100%). The mean pain intensity of the subjects at baseline was 7.09 ± 1.19 and the mean age of them was 34.34 ± 10.30 years (males: 34.85 ± 10.08; females: 33.41 ± 10.79). The participants in 3 groups were identical in all demographic and surgical-related characteristics (Table 1). Abbreviations: SD, Standard Deviation; n, Number. bOne-Way ANOVA test and Chi-square test were used. * Statistically significant (P value < 0.05). cValues are expressed as mean ± SD. There was no significant difference in the mean pain intensity at baseline between the study groups (P = 0.793). The results of repeated measure ANOVA showed a decreasing trend in pain intensity in all the groups. However, there was a significant difference in the trend of pain intensity between the three groups (P = 0.001). Thus, the trend of pain intensity had a significantly more decrease in the massage therapy than both the music therapy group (P = 0.001) and the usual-care group (P = 0.001). However, the trend of pain intensity was similar in the music therapy and the usual-care group indicating that there was no significant difference between them (P = 0.97) (Figure 2). A significant difference was also observed in the received opioid drug between the three groups (P = 0.001). Thus, the mean of received Pethidine was significantly lower in the massage therapy group than both the music therapy group (mean difference=9.73; P = 0.013) and the usual-care group (mean difference = 18.82; P = 0.001). Also, the mean of received Pethidine was significantly lower in the music therapy group than the usual care group (mean difference = 8.37; P = 0.047) (Table 2). aOne-Way ANOVA test was used (Post Hoc LSD). bStatistically significant (P value < 0.05). The results of this investigation showed that both the massage therapy and the music therapy groups can control postoperative acute pain and reduce received opioid drug after abdominal surgery although massage therapy was more effective than music therapy. According to Figure 2, the trend of pain intensity had a progressive (continuous) decline in the both groups (music and massage) over time, and after each session of intervention, they showed a greater reduction in pain intensity. Therefore, continuous intervention would be more effective. On the other hand, the first session of intervention caused a significant pain decline in the massage therapy group (Mean Change = -3.06); whereas, it was not significant in the music therapy group (Mean Change = -0.9). Therefore, massage therapy seemed more effective than music therapy in short-term programs of pain control. One session of massage therapy can acceptably control the immediate postoperative pain intensity in centers where there is a shortage of health workers and there is not enough time for caregivers to run multiple interventions. Since there is no comparative study on music therapy and massage therapy in terms of postoperative pain after abdominal surgery, we reviewed studies which compared these two methods in other patients. In general, the studies in this regard are limited to those comparing the both methods in pain control. The study by Kimber et al. (2008) on labor pain showed that although pain intensity declined more in massage therapy group than the music therapy group, the difference was not significant (24). The study by Taghinejad et al. (2010) showed that both music and massage therapies declined labor pain. However, massage therapy was more effective than music therapy (P=0.009) (25). These results are consistent with our findings, showing that both music and massage therapies were effective in controlling pain; however, massage therapy was more effective than music therapy. Note that the groups are different in these studies. The greater effect of massage therapy may be due to the physical effects caused by direct touch in massage. Our study showed that the mean of received opioid in the massage group was significantly lower than that of the music group and the mean of received opioid in the music group was significantly lower than that of the usual-care group. Unlike our study findings, the results of the study by McRee et al. (2003) showed no significant difference between massage, music, and control groups in terms of analgesic drug intake after surgery (23). The difference is possibly due to the fact that different types of surgeries were taken into account in the study by McRee et al. and they recruited a few patients in their study. Besides, methodological, cultural, and racial differences could also be the other reasons. In general, reducing opioid doses is necessary for improvement of the logistics of postoperative cares (18). Therefore, massage therapy can cause a decline in opioid intake. Lack of proper postoperative acute pain control would be associated with multiple complications, reduced acceptance of patients for health cares, longer improvement period, and increased costs (6, 10-12). Therefore, using non-drug therapies (massage and music) can cause an increase in the improvement process, faster recovery, and reduced length of stay. As a result, the need for drug therapies would decline (26, 27). Using non-drug therapies creates a therapeutic relationship between the caregiver and the patient, bringing about more collaboration and acceptance of care (17). Our study was associated with some limitations: 1. Study variable (pain) has a subjective nature and different factors can affect this variable. These factors were not controlled by the researcher, while they could cause bias in pain report. 2. It was possible that the subjects communicated with each other and shared the intervention information although we tried to avoid the communication of patients in different groups. The strengths of our study are as follows: 1. it was the first to compare music therapy and massage therapy on postoperative acute pain after abdominal surgery in order to provide clinical evidence for the better use of these methods. 2. Just one special area of surgery (abdominal surgery) was taken into account. Our findings showed that both music and massage therapies were effective in controlling postoperative acute pain after abdominal surgery. However, massage therapy was more effective than music therapy. Therefore, music therapy would also be an effective way for the patients who are not willing to use massage therapy for any reason. Also, this investigation indicated that massage therapy significantly declined the amount of received opioid drug. It is also recommended to compare these two methods on other problems in patients undergoing surgery. In addition, other non-drug methods can be compared with each other in future studies in order to find more effective methods for the clinical use. Retraining courses for health professionals and establishment of encouragement mechanisms for using non-drug therapies (especially massage therapy) as safe, inexpensive, effective and available methods are very helpful for controlling acute postoperative pain. This study is based on a thesis and sponsored by the research center of AJA University of Medical Sciences (AJAUMS). We would like to thank patients who participated in this research and staff in the surgical wards. Authors’ Contribution: Study concept and design, Amir Hosein Pishgooie; Mojtaba Miladinia and Shahla Aliyari, acquisition of data; Mojtaba Miladinia and Elham Mousavi Nouri, dnalysis and interpretation of data, Amir Hosein Pishgooie; Mojtaba Miladinia and Elham Mousavi Nouri, drafting of the manuscript, Amir Hosein Pishgooie; Mojtaba Miladinia and Shahla Aliyari, critical revision of the manuscript for important intellectual content, Amir Hosein Pishgooie and Mojtaba Miladinia, statistical analysis, Amir Hosein Pishgooie and Mojtaba Miladinia, study supervision, Amir Hosein Pishgooie.